The Wacom Bamboo Sketch Stylus is a lot of fun. While it is not great for art, it is quite utilitarian and a lot of fun. It is a great crayon for scratching out rough sketches and diagrams, drawing on photos, or writing notes. Most of my testing was in the app ‘Bamboo Paper’. The buttons on the side of the stylus are fully programmable and extremely convenient. I bound mine to the ‘eraser’ and ‘undo’ functions in Bamboo Paper. Make a mistake? Undo button right at your fingertips. Need to erase a little bit? The erase button is right there. Hold it down to erase and release to return to your brush. I’m sure there are tons of other bindings that are great but I found those to be the most useful for me. The weight is right on the money. Not light enough to feel cheap, not heavy enough to be burdensome. The exterior texture of the pen is nice and it feels very solid in the hand. The retail packaging it came in and the carrying case provided with the stylus are both very satisfying. Wacom obviously spent time on the carrying case, and it really is top notch. One thing I don’t understand though… after all the evident effort spent on the case, why can’t I plug a cord into the case to charge the stylus? It seems like the obvious thing to do. 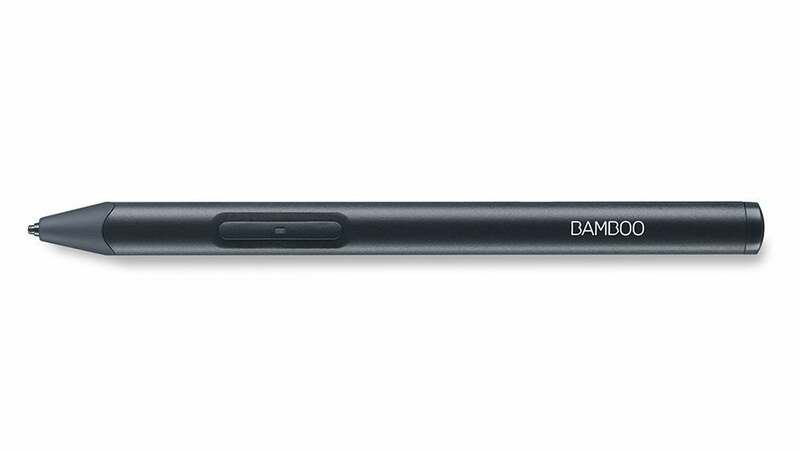 The Wacom Bamboo Sketch stylus requires an app with built in capability. You must pair it with the app, not the iPad, but it was very easy, no hiccups. Simply open the context menu, select ‘connect stylus’ (different in various apps) and hold the tip of the stylus in the circle on the screen. I had to click one of the buttons to wake the stylus up, but as soon as I did, it connected and started working instantly with no further setup. The stylus really should charge in the case, or at very least, come with a cord. 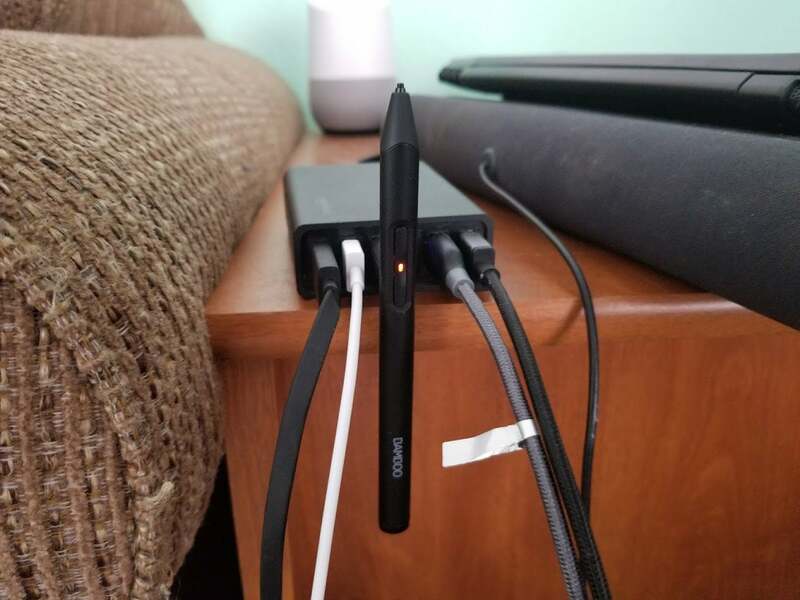 Hanging the pen using a magnetic dongle from a USB plug is super weird, and I had to move my charge hub to the edge of my end table to charge it. This is not an artist’s tool. Small, short, and slow movements don’t seem to translate very well. The pressure spring seems too light, and I find myself at about 3/4th depressed when drawing normally. The tip location isn’t quite as accurate as I was expecting. Overall, it’s great for utilitarian purposes, but not for art. For Wacom being a company who prides themselves on serving the art industry, they have made an interesting choice here. I don’t believe they could have made it much more accurate than they did, but knowing their branding I am surprised that they released it at all. All of this isn’t to say that the Sketch is garbage; it isn’t. It’s just not for art. It’s for back of the napkin sketches, quick notes, or drawing changes onto a photo while talking to a customer. 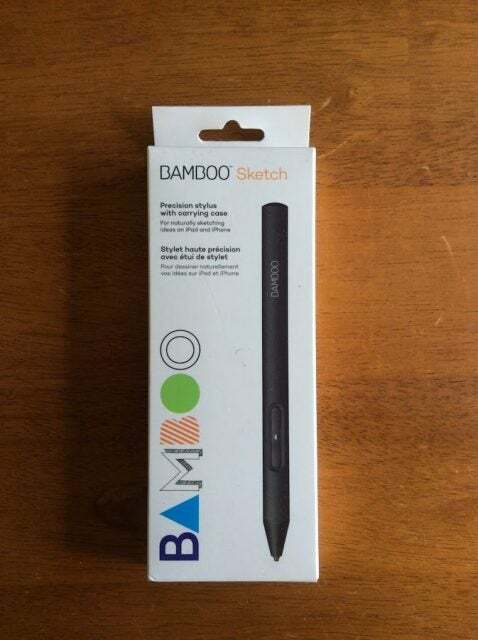 Buy the Wacom Bamboo Sketch Stylus here.